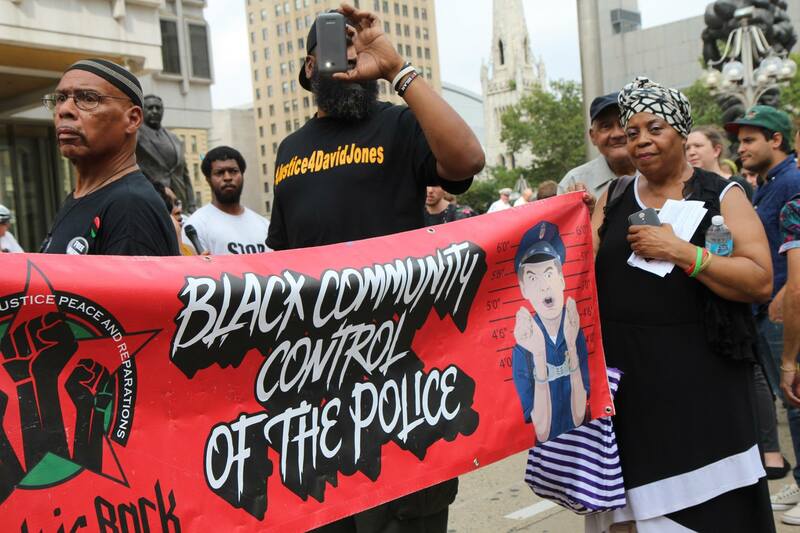 Image caption: Protestors hold up a banner reading “Black Community Control of Police” next to a white cop in handcuffs and three Black Power fits. Members of this coalition include Philly for Racial, Economic and Legal (REAL) Justice, Sankofa Community Empowerment, and the Black is Back Coalition. The bill presented to City Council has its roots in the day to day organizing of these groups. Philly for REAL Justice launched a campaign to take down the Frank Rizzo statue in front of the Municipal Services Building over a year ago. Other activists were present at the introduction of the bill, including Carnell Williams-Carney, a Black man shot and paralyzed by Philadelphia police officer Ryan Pownall. In 2010, Pownall shot the fleeing Williams-Carney in the back after stopping him in Frankford. Officer Pownall shot and killed David Jones (another Black man) this summer in a similar incident. Both men were running away. Despite this firsthand story of out-of-control police, no City Council members would support the coalition bill or any of its parts. Even so-called progressives like Helen Gym, who called for the Rizzo statue to be removed, would not take a stand. While these politicians are, when pressured, willing to remove symbols of oppression, they seem unwilling to challenge the material conditions that perpetuate oppression. During the hearing, members of the coalition were arrested for “disrupting the flow of business,” even though they had signed up to speak during the public comments time. Arrestees were further harassed when officers “lost” the keys to the police van they were held in and were forced to cut the locks, delaying the arrestees’ release. Since confederate statues have been pulled down or removed in cities like Durham, NC and Baltimore, MD, the Philadelphia police guarded the Rizzo statue 24 hours a day for almost a month. At taxpayers’ expense, of course. The result has been two arrests for minor vandalism. One person was arrested for egging the statue and was found not guilty at trial. The second person is still awaiting trial. The “Frank Rizzo Down” campaign reflects one part of Philly for REAL Justice’s organizing strategy of “Disempower, Disarm, Disband the Police.” It is part of “Disempowering” the police by attacking the cult of worship the police create for themselves. Just as most Confederate statues were put up in the early 20th century to cover up the history of Black-led Reconstruction governments in the South, the Rizzo statue was put up to memorialize the victory of white reaction over the Civil Rights and Black Power movements in Philly. The goal of the “Black Community Control of Police” bill is to lay the groundwork for Black- led alternatives to the police. Alternatives can take many forms, including de-escalation training, conflict mediation, survivor-led restoration initiatives, and neighborhood-run support and response networks. These alternatives are not just desirable, but necessary. The United States currently imprisons more people than China. Almost 50,000 people are in Pennsylvania state prisons alone. The police intervene in situations as minor as noise complaints, funneling more Black and Brown people into overcrowded prisons. On Nov. 3, Mayor Kenney’s administration announced that the Rizzo statue was to be removed from Thomas Paine Plaza and placed in a different location in the city. The rest of REAL Justice’s demands have, predictably, been ignored.